Beautifully maintained resort on greenbelt lot in gated Starwood. 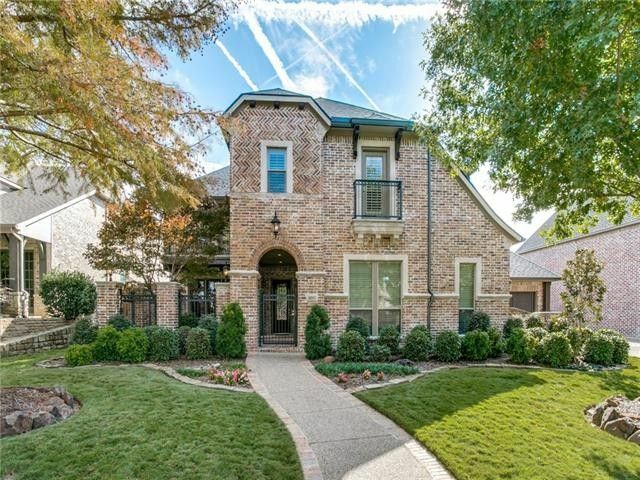 Inviting brick & gated front courtyard with new front door. Charming single-owner home includes plantation shutters & hardwood floors throughout, 2 wood stairs, 2 formal studies & 2 bedrooms down. Stunning open plan kitchen that features double ovens & gas cooktop encased in brick, new granite, travertine & pendant lights. Striking master bath completely remodeled & home freshly painted throughout. Breathtaking backyard boasts pebbletec salt pool, new cedar ceiling, outdoor kitchen, shower & gorgeous private view of mature trees. Perfect house for entertaining. Radiant barrier, roof 2017, 17 seer AC 2016, 21 seer AC 2017 & hot H20 heaters 2015. Directions: From Dallas Tollway and Lebanon go West on Lebanon, Right on Starwood Drive, Left after guard gate on Starwood Drive, Right on Texas Drive, Left on Riverstone, Left on Shoreline Dr., Right on Stillwater Trail, home on Left.